Understanding How to Move Forward: Before starting your strategic planning, let’s answer a few questions to see where you are: Action Map. 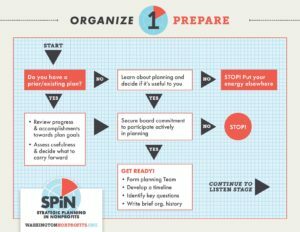 Learning Tool Kit: We’ve created an overview of the strategic planning process and a SPiN Toolkit to guide you through your strategic planning. Visit the SPiN Key Documents page to see all the resources available for you to download. Ready to Get Started? We know that you learn whenever you have a challenge to solve. Strategic Planning in Nonprofits (SPiN) works well for “a la carte” learning. Watch the video that touches on your challenge. PREPARE: A key to successful Strategic Planning is “planning to plan”. To achieve a thoughtful plan that is truly strategic, you’ll need an effective process that is inclusive, transparent, and well-informed. LISTEN: When an organization’s leadership knows about the people you serve and other relevant data about your program and organization, your strategy improves, and you gain respect among your key audiences. You will be able to tell your story better, and your relationships and community impact will grow. Let’s start with a Nonprofit Health Check-up. ENVISION: When your organization invests time to develop or renew a powerful mission and vision, you will be able to answer the questions “Who are we?” and “Why do we exist?”, have a strong connection to your organization’s core purpose, and set the stage for a strong, well-grounded strategy. PLAN: It is important to clarify what specific areas of focus and strategies you will use to achieve your mission. Planning helps you to chart a course to turn your vision into reality; determine what actions best support your Mission and Vision; ensure that your plan is right-sized and achievable by analyzing resource and capacity issues; inspire others to take action to help your organization to succeed. EXECUTE:We have all heard stories about plans that sit on the shelf and are never referred to again. You have just done a lot of work to set the strategic direction of your organization and get everyone on the same page. Be sure to continue to utilize the plan framework and hold yourselves accountable to reach your goals. EVALUATE: Evaluation will help you learn whether your activities are producing the desired results or change you are seeking to accomplish, gain new insights into how you can improve your programs and increase your impact; demonstrate to funders and donors that your work is making a difference; and give you data that can serve as a foundation for your next strategic plan.